One of the greatest pleasures of my job is introducing new wine experiences to jaded palates. in fact that limiting my list of Great Portuguese Wines to just 50 was something of a challenge. secondly, to only have one wine from each producer. To make your task easier, I’ve grouped the wines into five categories, with ten wines in each. for many is still unexplored territory a little more user-friendly. grapes, and as I hope this section shows a diversity of styles – they deserve attention. remains is of super quality – enjoy. and imported grape varieties, yet all with a Portuguese accent. occasion. 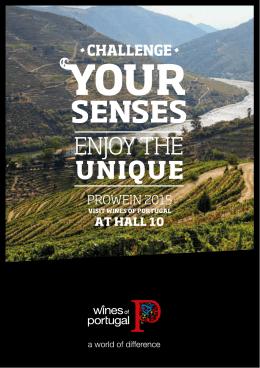 Once again, we will have the opportunity to taste some of Portugal’s best wines. CARM - Casa Agrícola Reboredo Madeira, Lda. 3 Howard Building, Chelsea Bridge Wharf, 368 Queenstown Rd. QUINTA DE COVELA SOCIEDADE AGRÍCOLA S.A.
QUINTA DO NOVAL – VINHOS S.A.
Charles Hawkins & Partners Ltd.
Stockists: Great Western Wine, Bath – T: 01225 322800. Hennings Wine Merchants, Pulborough –T: 01798 872485.